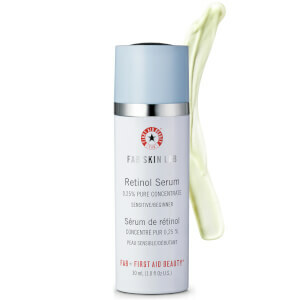 Transform rough and dull-looking skin with the First Aid Beauty Skin Lab Resurfacing Liquid; a potent yet respectful formula that resurfaces the complexion, without irritating sensitive skin. Harnessing a 10% concentration of four Alpha-Hydroxy Acids, the liquid effortlessly glides over the visage, visibly smoothing skin and improving its texture. Licorice Root, Mulberry Root and Lemon Peel Extracts work in synergy to perform a brightening effect, which offers the complexion an enviable radiance. Finished with First Aid Beauty’s signature Skin Saver Complex, which combines Hyaluronic Acid, Vitamin C and Aloe, the resurfacing liquid leaves skin feeling soothed, nourished and protected. Expect an ultra-smooth and comfortable complexion with minimised pores, fine lines and wrinkles. 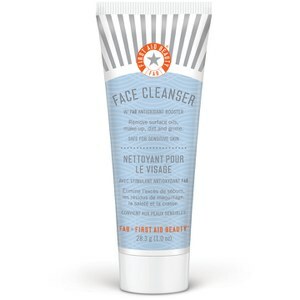 Free from Alcohol, Artificial Colorants, Artificial Fragrance, Lanolin, Mineral Oil, Parabens, Petrolatum, Phthalates, Propylene Glycol, Sulphates. After cleansing, once daily apply one pump to the entire face and décolleté, being careful to avoid the eye and lip areas. For daytime, follow with SPF. Precautions: Sunburn Alert: FAB Skin Lab10% AHA Resurfacing Liquid contains Alpha Hydroxy Acids (AHAs) that may increase skin’s sensitivity to the sun and the possibility of sunburn. Use sunscreen, wear protective clothing and limit sun exposure while using this product and for one week afterward. WaterAqua/Eau, Polysorbate 80, Glycolic Acid, Butylene Glycol, Caprylic/Capric Triglyceride, Sodium Hydroxide, Malic Acid, Tartaric Acid, Lactic Acid, Citrus Limon/Lemon Peel Extract, Colloidal Oatmeal, Magnesium Ascorbyl Phosphate, Hydrolyzed Elastin, Papain, Hydrolyzed Hyaluronic Acid, Soluble Collagen, Avena Sativa (Oat) Kernel Extract, Triolein, Ceramide NP, Cucumis Sativus (Cucumber) Fruit Extract, Glycyrrhiza Glabra (Licorice) Root Extract, Morus Alba Bark Extract, Phytosteryl Canola Glycerides, Allantoin, Lecithin, Lysolecithin, Oleic Acid, Palmitic Acid, Maltodextrin, Aloe Barbadensis Leaf Juice, Glycerin, Tocopherol, Glycine Soja (Soybean) Oil, Caprylyl Glycol, Linoleic Acid, Sclerotium Gum, Xanthan Gum, Pullulan, Mica, Stearic Acid, Leuconostoc/Radish Root Ferment Filtrate, Silica, Phenoxyethanol, Chlorphenesin, Disodium EDTA.